In honor of National Pi Day and the imminent opening of The Wizarding World of Harry Potter at Universal Studios Hollywood, I couldn't pass up the chance to make proper Harry Potter-inspired Pumpkin Pasties with Ground Beef, Onions, and Sage. I made Pumpkin Fillo Pasties last fall for my Harry Potter-inspired Birthday Party using fresh diced pumpkin, but since pumpkin is no longer in season, had to resort to canned pumpkin for this recipe. The mashed filling ended up making the pie soggy after a while, so it's best to eat these right away if you want to be able to hold them in your hands. They still tasted good when I reheated them in the toaster oven hours later, but needed to be plated. I made the pumpkin pasties about 6 inches long, a good meal-sized pasty, about the size of the Cornish pasties I used to eat when I lived in London. 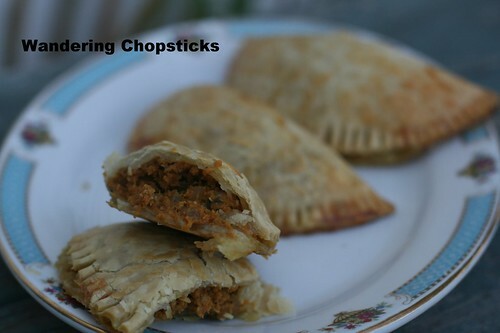 The mashed pumpkin filling made this version sweeter than when I used fresh diced pumpkin, but make no mistake, these pasties are meant to be savory. Pack them for a picnic or for a ride on the Hogwarts Express. But it wasn't until last fall when I stumbled upon this Gothamist article about Phumplings in Brooklyn that the pho-spiced dumplings started to take shape. 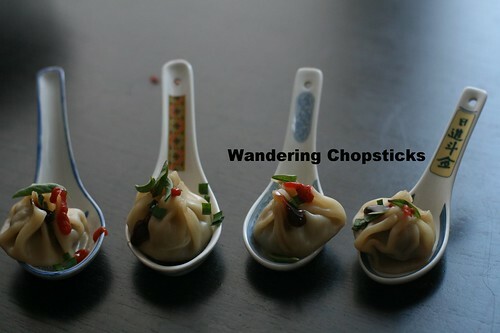 Phumplings are larger and filled with soup, closer to xiao long bao (Shanghai soup dumplings). A bit too much work for lazy old me. Not that I probably won't try that at some point. Instead, I decided to make regular dumplings with pho spices. I had a rather lean cut of beef, but if you use fattier ground beef, you can get juicier dumplings. I used the same proportion of spices and aromatics as my Pho Burgers -- pureed onion, garlic, and ginger with ground cinnamon, cloves, and star anise spices. Then topped the dumplings with green onions (actually, chives from the garden) and basil, small squirts of Hoisin Sauce and Sriracha, and squeezed a bit of lime. With all the components in place, it was like eating pho in one bite. 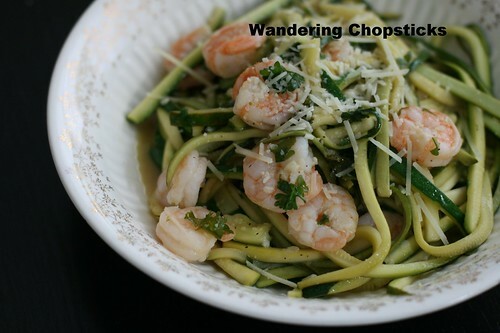 Italian Shrimp Scampi Low Carb Zucchini "Noodles"
I'm not sure what sparked my craving for shrimp scampi, but I couldn't get the buttery, lemony shrimp pasta dish out of my mind. I've been trying to eat healthier though, so figured I could experiment with some zucchini noodles. Now, if you have a Zoodle Slicer or a Veggetti or whatever, this would go a lot faster, but I found julienning the zucchini worked just fine. It was actually quite therapeutic to slice and slice the zucchini until I had a colander full of thin strips. Of course, you can use regular spaghetti noodles with this recipe if you wish, but I thought the buttery, lemony zucchini noodles and shrimp totally hit the spot.